Just imagine sitting around a crackling campfire wearing these handmade, boho style earrings, their glittery beauty keeping time with the music and wonderful conversation with friends! 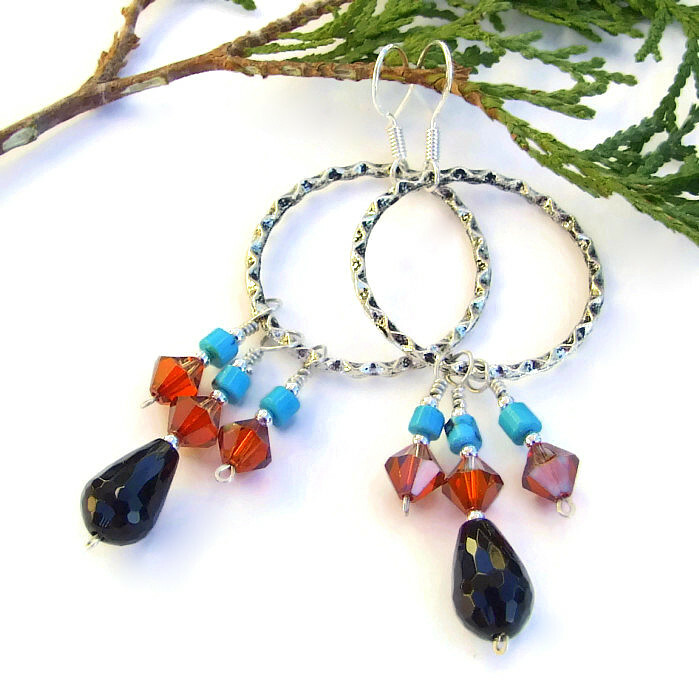 Faceted black onyx teardrops, turquoise heishe, and fiery looking Swarovski crystal dangles were carefully wire wrapped onto textured, lead free pewter hoops to create the GYPSY DANCE one of a kind earrings. Colorful and sparkly, they speak to the free spirited side of a woman. Carefully designed and handcrafted by Catherine of Shadow Dog Designs, the unique loveliness of these Coachella style earrings make a bold statement for the woman who is not scared of being bold! The sparkling boho exquisiteness of the GYPSY DANCE earrings started out with faceted black onyx teardrops. The color is a deep black which wonderfully complements the twinkle of the facets - it almost looks like the onyx teardrops have their own glistening energy source. The black onyx was used in the middle dangle of the three, making that dangle the longest. To mimic the fiery color of a campfire, I chose to use "crystal red magma" Swarovski crystals on each of the three dangles. The red magma crystals have a special coated surface, one that allows the powerful core color to shine through. Swarovski crystals have been world famous for over 100 years for their outstanding sparkle created by exact geometry, precise angles, perfect cut and special polishing. 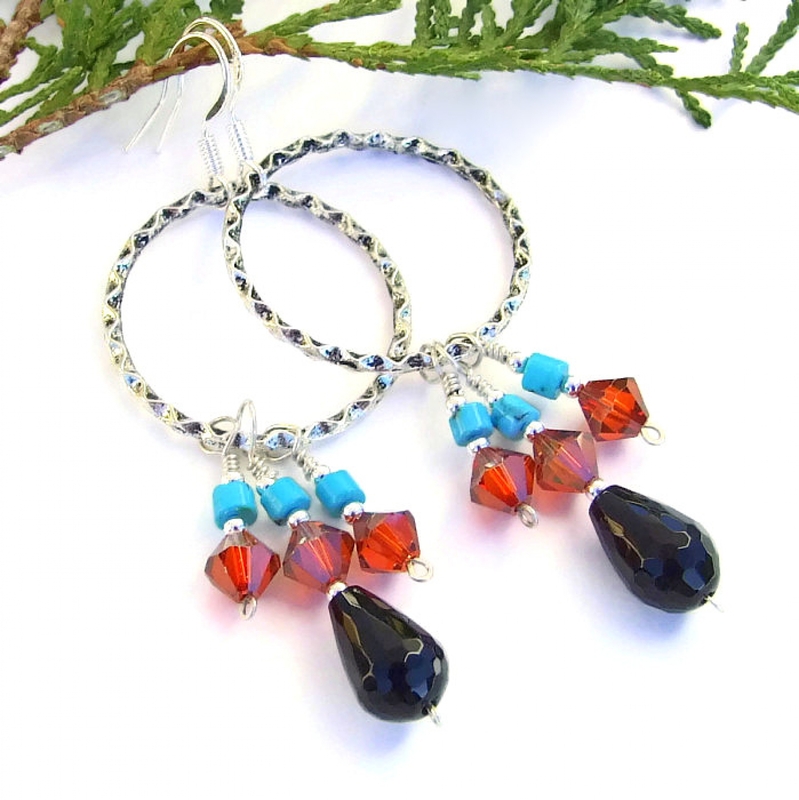 The "red crystal magma" crystals used in the GYPSY DANCE earrings show this brilliantly! The crystals were separated from the black onyx by 2 mm sterling silver beads. A perfect cooling complement to the black onyx and fiery Swarovski crystals is the addition of gorgeous blue sky colored turquoise heishe. Each piece of heishe has a bit of darker matrix, a perfect counterpoint to the black onyx. The heishe was framed at the top and bottom with 2 mm sterling silver beads. Each dangle was strung on handmade (by me) sterling silver headpins with a hand hammered loop at the end. Each dangle was then carefully wire wrapped to a textured pewter hoop. The pewter hoop is lead free and of such high quality that it looks exactly like sterling silver (so you get the look of sterling without the sterling price!). The hoops are textured with a rounded zigzag design on the front and back. The textured design catches and reflects back the light adding even more sparkling gorgeousness, as if the earrings needed it! 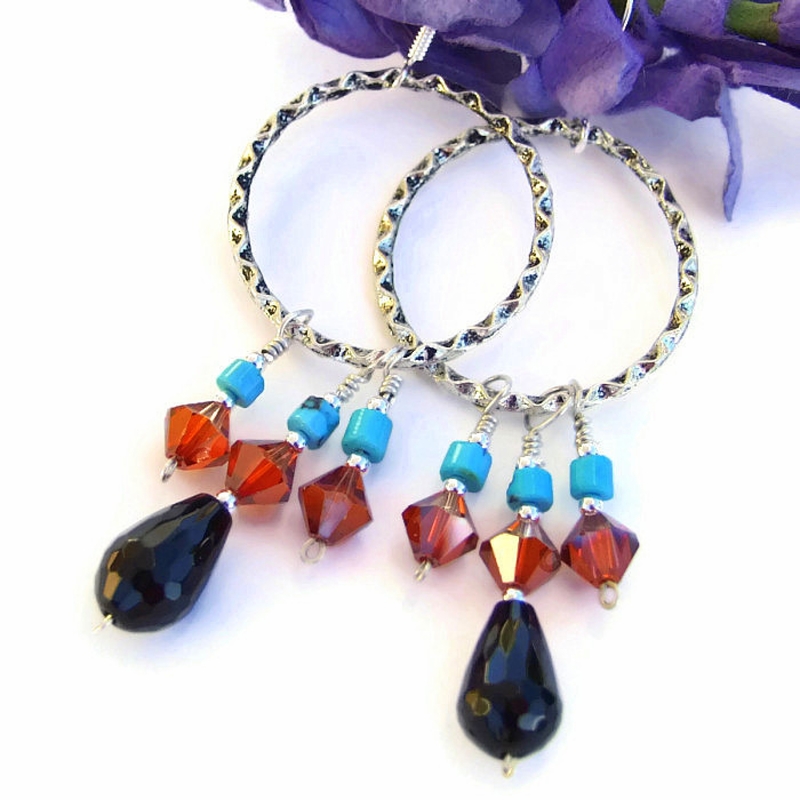 To finish the GYPSY DANCE earrings, the hoops were connected to sterling silver French hook earwires. A perfect finish to fun boho earrings! 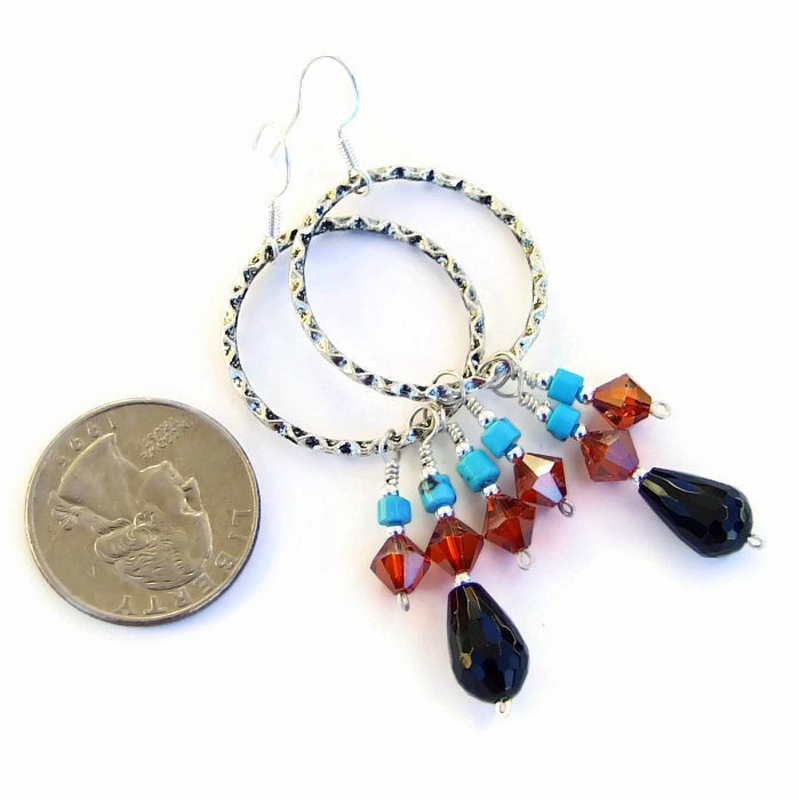 For a better understanding of the relative size of the GYPSY DANCE earrings, please be sure to check out photo #5 for a size comparison with a quarter. Black Onyx is believed to be a powerful protective stone and is used as a defense against negative thinking. Man made crystal carries the energies of transformation, rebirth and communication. Turquoise is a stone of wholeness, promoting a sense of unity with all that surrounds us; it brings peace of mind, a soothing energy and healing of the spirit. Pewter is believed to be very grounding, bringing the wearer back to reality. Silver is a metal of love and healing; it is a mirror to the soul, helping us to see ourselves as others see us. 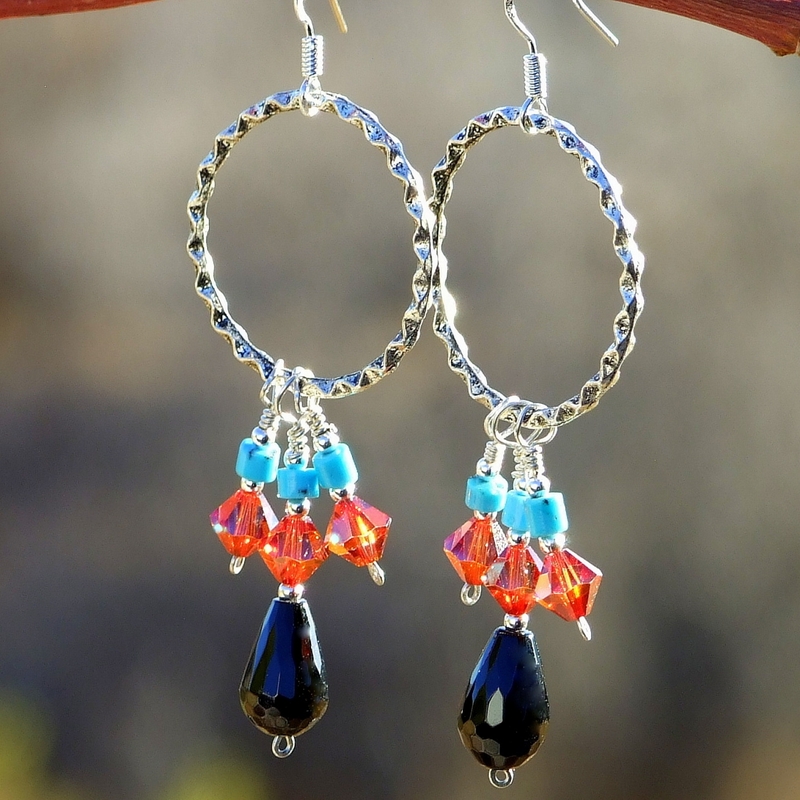 The GYPSY DANCE earrings will be carefully packed in an organza jewelry bag, perfect for gift giving to a loved one . . . or to yourself!